The Upper Peninsula high school boys basketball All-U.P. teams were released Saturday morning by the Upper Peninsula Sportswriters and Sportscasters Association. Ewen-Trout Creek senior Jake Witt was named Mr. U.P. Basketball, as well as the Class D Player of the Year. 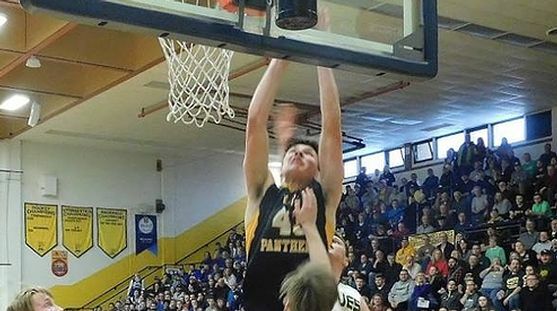 Iron Mountain sophomore Marcus Johnson was named the Class A-B-C Player of the Year. Witt and Johnson were joined by Dollar Bay's Devin Schmitz, Ishpeming's Hart Holmgren, and Sault Ste. Marie's Brandon Paul on the Dream Team. George Butvilas, Houghton, Jr.; Austin Forbes, Gwinn, Jr.; Jaylen James, Newberry, Jr.; Treylon McFerrin, Marquette, Sr.; Jared Nash, Escanaba, Jr.; Luke Ogea, Marquette; Rudy Peterson, Gladstone, Jr.; Josh Plante, Norway, Sr.; Gavin Sundberg, Ishpeming, Jr.; Reece Waara, L’Anse, Jr.; Jaden Bicenzi, Iron Mountain, Jr.
Kaleb Johanson, Brimley, Sr.; Josh Logan, Forest Park, Sr.; Tristan Masuga, Cedarville, Jr.; Dylan Mills, Rudyard, Jr.; Eli Nordine, Ewen-Trout Creek, Jr.; Trey Norris, Cedarville, Sr.; Mason Saubert, Wakefield-Marenisco, Jr.; Lucas Sundling, Rapid River, Sr.; Carson Turner, Jeffers, Sr.
Kyle Anderson, Menominee, Jr.; Tyler Beauchamp, Kingsford, Jr.; Nathan Beckman, Westwood, Jr.; David Delarye, Westwood, Sr.; Keagan Monroe, Menominee, Soph. ; Caden Pellizzer, West Iron County, Jr.; Alec Rajala, L’Anse, Sr.; Shane Thompson, Sault Ste. Marie, Sr.; Austin Willette, Escanaba, Jr.
Aaron Barnes, Chassell, Sr.; Scout Bigger, Engadine, Sr.; Andrew Blanchard, Engadine, Sr.; Ethan Brown, Stephenson, Sr.; Noah Gorzinski, North Central, Soph. ; Riley Hendrickson, Forest Park, Jr.; Colton Lindemann, Baraga, Sr.; Wade Krysiak, Superior Central, Sr.; Tristen Lyons, Brimley, Jr.; Max Nylund, Forest Park, Jr.; Beau Rondeau, Superior Central, Jr.; Trenton Schaff, North Central, Sr.; River Shumate, Republic-Michigamme, Sr.; Jimmy Storey, Pickford, Soph. ; Brayden Tomes, Bessemer, Sr.; Cameron Willemsen, Rapid River, Sr.